Costas Lapavitsas is a professor of economics at the School of Oriental and African Studies (SOAS), University of London, and the author of Profiting Without Producing: How Finance Exploits Us All (Verso, 2013). Ivan Mendieta-Muñoz is a course convenor in economics at SOAS and a PhD candidate in economics at the University of Kent. The financialization of capitalism has been marked by the sustained rise of financial profits. 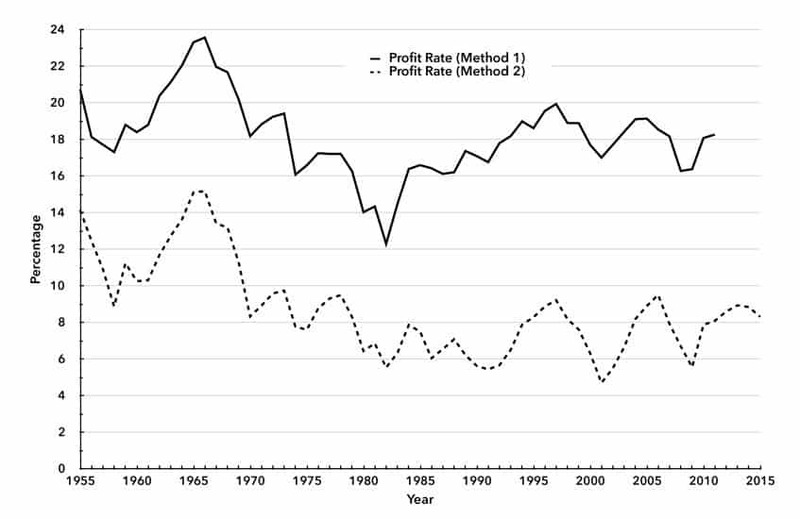 In the United States, financial profits as a proportion of total profits rose enormously from the early 1980s to the early 2000s, collapsed during 2007–09, and subsequently recovered, but without reaching previous heights. During this period, the trend of the average rate of profit has been largely flat. The relative rise of financial profits in spite of stagnant average profitability represents a theoretical and empirical conundrum. We will argue that the answer should be sought partly in financial expropriation, but also in public interest rates kept at extraordinarily low levels. In this light, the rise of financial profits represents a vast public subsidy to the financial system characteristic of financialization. Baran and Sweezy’s Monopoly Capital is a milestone in political economy, a book that will be read for decades to come. Some of its ideas have fallen by the wayside in the course of time, but how many political-economic contributions from the second half of the twentieth century would withstand comparison with it for originality and breadth? The true hallmark of a great book, nonetheless, is its ability to cast light on phenomena that occur well after its publication. Works in political economy, in particular, have always sought to identify the trends that shape the future of capitalism. In this regard, Monopoly Capital, and indeed the entire Monthly Review tradition emanating from it, has stood the test of time particularly well, since it has forged an analytical path to the financialization of capitalism. Financialization is a much-debated concept in social science, even if it is still treated with suspicion by Marxist economics and completely ignored by mainstream economics. The indifference of the mainstream is not in itself a problem, since intellectual progress in economics during the last several decades has often originated in other social sciences. Financialization captures a profound transformation of contemporary capitalism that is apparent to the naked eye; at some point even mainstream economics will be forced to recognize that something is afoot. Non-financial enterprises have become financialized, insofar as they have become more distant from banks, while drawing profits from financial operations undertaken on their own account. Banks have shifted their sources of profit away from non-financial corporations by turning to transactions in financial markets as well as to lending to households. Households have become financialized, as financial transactions have penetrated into the realm of household revenue, both to borrow and to save, in ways unprecedented in past historical periods. Personal revenue has become a significant source of profit for banks. These historical tendencies have occurred spontaneously, but they have also been abetted by the state through the policy of financial liberalization, as well as through state support for the financial system in times of crisis. It should be stated clearly that financialization is a product of the state in terms of regulation and intervention in the financial sphere. It is shown below that financialization is also the product of the state in terms of the revenues and profits earned by financial agents. Every historical period in the development of capitalism is characterized by distinct patterns and sources of profit. Mercantile capitalism in the seventeenth and eighteenth centuries was marked by profits earned by the great trading chartered companies. Industrial capitalism in the nineteenth and twentieth centuries was marked by profits earned by industrial enterprises employing wage labor. Financialized capitalism, emerging in mature industrial countries in the late twentieth century, is marked by the profit-making characteristic of the sphere of circulation and finance. The most striking aspect of financialization, and the feature that truly defines it as a historical phenomenon, is the tremendous growth of financial profit. The following sections turn to the behavior of financial profit in the U.S. economy in the postwar period. 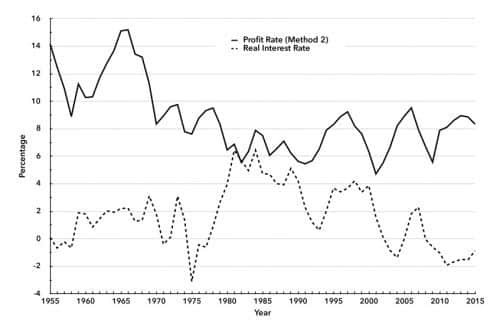 The relationship between financial profit and the average rate of profit is examined in some detail, showing that financial profit has increased while average profitability has been broadly flat. This result poses a conundrum, given that industrial profit is the ultimate source of much financial profit, notwithstanding financial expropriation. We will show that part of the explanation lies with the behavior of public rates of interest, which, during the years of financialization, have been pushed to extraordinarily low levels, often in the region of 0 percent. A powerful source of financial profit in the years of financialization appears to have been a vast public subsidy given by the state to the capitalist class as a whole. Financialization truly is a creature of the state in a profound way. To further pursue this point, it is necessary first to discuss the content of financial profit. Industrial capitalism is based on the generation of a fresh flow of profits (surplus value) in production through the exploitation of wage labor. Profit from production (industrial profit) is also the source of the commercial profit appropriated by merchant capitalists, who trade the finished output of industrial capitalists. Profit from production is, furthermore, the ultimate source of the interest paid to the lenders of money by industrialists and merchants. Positing industrial profit as the source of other forms of profit is not to deny that still further sources of profit also exist. Merchants, for instance, could earn profits by simply taking advantage of price disparities in distant markets. In such cases, profit would be a transfer of value from one trading party to another, a zero-sum game. In general, however, the most innovative contribution that Karl Marx made to economic theory was to identify capitalist profit as a fresh flow of value added to output per period, through the exploitation of labor in production. A moment’s thought would suffice to show that this general approach must be further elaborated, if theory is to account for financial profit. For one thing, the content and form of financial profit are not immediately apparent. Taken very generally, for instance, financial profit could merely indicate profit generated through activities that are specific to the financial sector. This would be a very wide definition that would include many economic agents earning financial profit: from individuals to non-financial enterprises to financial enterprises. It could also refer to a wide range of transactions that result in financial profit, including money lending, trading in financial assets, or even trading in real assets that have acquired a financial carapace, such as housing. To gain precision and to obtain meaningful results, financial profit will here be taken to mean profit earned by financial institutions alone. Needless to say, this is a narrow definition. It leaves out, for instance, financial profit earned by non-financial enterprises, which is an important aspect of financialization, especially among large enterprises. It also leaves out the extraordinary earnings of the top and middle management of financial institutions, which often accrue as bonuses and appear to be payment for work—even taking the form of wages or salaries—when they are simply a share of profit. It is impossible reliably to estimate the aggregate sum of such payments, however, and hence they are best left out of the account; the loss of generality would be limited. Thus, financial profits in the analysis that follows refer to the profits made by a range of banks and near-bank financial institutions, as these are currently classified by the U.S. National Income and Product Accounts (NIPA), which provides the best available evidence of its kind internationally. Even with this narrow definition, however, there are still further analytical issues to consider. Financial profits could in principle arise from the straightforward lending of money, in which case they would be a form of interest. To be more precise, they could arise from the spread between the lending and the borrowing interest rate of financial institutions (intermediaries). In such a case, and if the borrowers from and the lenders to financial intermediaries were industrial or commercial capitalists, there would be few conceptual problems: the ultimate source of the profit of financial intermediaries would be surplus value generated in production. If, however, the borrowers and lenders were private individuals, as for instance could happen in the case of mortgages or unsecured consumer loans, financial profits would still arise from the spread between lending and borrowing rates, but their ultimate source would be the money income or money savings of individuals. They would represent a transfer of value to financial institutions from various money incomes or money stocks, making them a form of financial expropriation. This is a characteristic feature of financialized capitalism. Financial profits could also arise, furthermore, from fees and commissions paid to financial intermediaries to facilitate the trading of financial assets. In that case, they would represent a share of the money committed to the transactions by the ultimate transacting parties. If, finally, the financial intermediaries earned profits by directly engaging in asset trading on their own account, these profits would still represent a share of the money committed to the transactions by the counterparties. These two forms of financial profit arising from trade in financial assets require further brief analysis. In the first instance, the profit made by a financial institution through trading financial assets (either directly or as commission) is always simply a part of the money committed by the transacting parties. However, the ultimate source of such profit evidently lies in the returns to which the traded financial asset give a claim, and which are effectively apportioned to all participants in the transactions who possess or trade the financial asset for a period of time. Thus, the profit made by a financial institution in the first instance would be an advance on the returns expected to accrue to the final holder of the asset; the advance would be made out of the money committed in the first instance by the transacting parties.4 If the returns actually materialized as expected, the advance would be recouped and financial profit would simply be a part of the surplus value generated in production (assuming that the transacting parties were industrial or commercial capitalists). If, however, returns failed to materialize as expected, the advance would not be recouped, and financial profit would remain simply a part of the money committed by the transacting parties. In that case, financial profit would be a form of wealth or income transfer, i.e., a form of financial expropriation. Note that even if returns actually materialized as planned, financial profit would still represent financial expropriation, as long as the transacting parties were non-capitalists. That would be the case, for instance, if financial assets were based on home mortgages, since the future payments attached to these assets would simply be a fraction of the debtor’s wage or salary. Financial profits are thus a highly complex economic category; one notion that could be immediately dispensed with, however, is that they are somehow “fictitious.” Marx used extensively the term “fictitious capital” in his analysis of the financial system, by which he indicated several phenomena, most prominently the discounting of future returns which would result in completely fictitious prices for financial assets—i.e., net present value.5 Fictitious prices—arising as net present value or otherwise—can and do play dramatic tricks in the financial markets, since they generate extraordinary figures for “value” when the money capital actually traded is merely a fraction of the total price of the assets. In particular, fictitious prices could be subject to sustained increases or decreases that would be unconnected to value emerging in production. Consequently, they could systematically generate capital gains and losses, thus leading to potential profits or losses from financial trading. Nonetheless, the point remains that, once money has been advanced actually to purchase a financial asset, financial profit would still derive either directly from the money committed to the purchase, or indirectly from the future returns to the asset. The sum obtained as profit would be either a share of the money advanced, or a share of the future returns (surplus value, or even wages and salaries). There would be nothing fictitious about that sum of money profit, irrespective of how fictitious the asset prices might be. In sum, broadly speaking, there is a close relationship between industrial profit and financial profit, though the latter could also arise from sources different from the former. For our purposes, it follows that the empirical relationship between industrial and financial profits during the last four decades would be able to cast light on the characteristic features of financialization. Establishing the path of the two variables for the United States, for which suitable data is available, would offer fresh insight into the economic and social content of financialization. where FP denotes financial profits, which refer to pre-tax profits of finance, insurance, bank and other holding companies; and CP denotes corporate profits of domestic industries.6 Both FP and CP include inventory valuation and capital consumption adjustments. Source: “Table 1.14. Gross Value Added of Domestic Corporate Business in Current Dollars and Gross Value Added of Nonfinancial Domestic Corporate Business in Current and Chained Dollars”; “Table 6.1. Current-Cost Net Stock of Private Fixed Assets by Industry Group and Legal Form of Organization”; “Tables 6.16A, 6.16B and 6.16C: Corporate Profits by Industry,” National Income and Product Accounts (NIPA), U.S. Bureau of Economic Analysis (BEA). From the end of the Second World War to the early 1960s (shown only partially in the graph) financial profits began to rise as a proportion of total profits. During that period, U.S. banks divested themselves of the enormous holdings of government bonds accumulated during the war; during the same period, interest rates were low and controlled, while inflation was also low. More relevant for our purposes, however, is the period from the early 1960s to the early 1980s, during which financial profits made up a fairly stable part of total profits. That period was marked by the gradual abolition of controls over interest rates, a rise in inflation and, crucially, a profound crisis of capitalist accumulation in the 1970s, which ushered in financialization. From the early 1980s to the early 2000s, the period of aggressive financialization, financial profits exploded as a proportion of total profits. The sharp rise of financial profits during these two decades was marked by pronounced cycles, and came to an end with the profound crisis of 2007–09. Indeed, the bubble that preceded the crisis can be seen as a frantic attempt to boost financial profits following the peak of 2003. The crisis was characterized by a sharp collapse of financial profits, while recovery has been marked by an equally sharp rebound. The period since 2009 exhibits stagnant, or even declining, financial profits, although levels remain still very high. Financialization appears to have stopped surging ahead, though it is not in retreat. The significance of the path of financial profits over time would become clearer if it was compared to the average rate of profit in the U.S. economy. As explained above, the main source of financial profit is industrial profit, although there are also other sources, summed up as financial expropriation. The path of industrial profits in the United States in the postwar period could be ascertained by calculating the average rate of profit for the U.S. economy. Two different but related estimates are offered in this paper. The time path of the rate of profit using both methods are shown in Chart 2. There is broad agreement among the two methods of estimation. The rate of profit in the U.S. economy showed a clear downward trend from the early 1960s to the early 1980s. Note that there was a pronounced rise in the first half of the 1960s, and an equally pronounced decline in the second half of the decade. 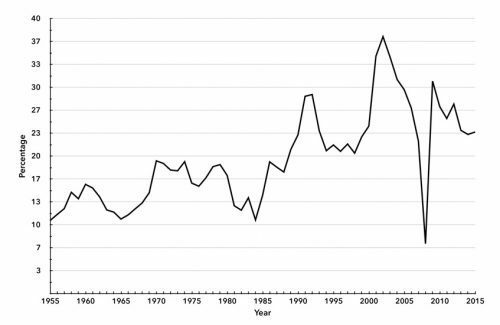 The decline in average profitability in the late 1960s ushered in the great crisis of 1973–74, though the mechanisms and processes through which the crisis occurred are anything but obvious from the simple trend of the profit rate. It is a crass error—and unfortunately all too common—to infer a causal link from the calculation of the rate of profit to the performance of accumulation, especially to the outbreak of crises. Be that as it may, the average profit rate in the U.S. economy continued to decline in the 1970s, a trend that only came to an end in the early 1980s. 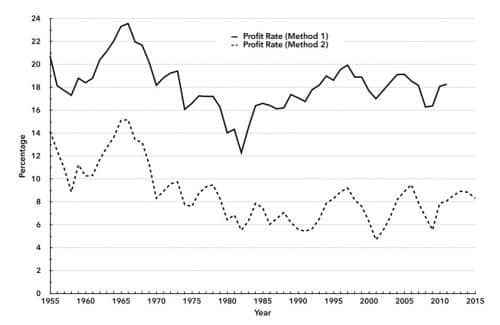 Both methods of calculation also agree that profitability after the early 1980s exhibited no further tendency to decline over time, although there have been pronounced cyclical fluctuations. Indeed, the measurement of method 1 indicates that the rate of profit actually recovered from the early 1980s to the mid-1990s and then remained broadly flat, again with cyclical fluctuations. Financialization has not been a period of falling average profit rates. It is a misconception that financialization occurred as capitalists moved to the sphere of finance in search of profits, presumably because profitability had been falling in the sphere of production. Quite apart from the legion of analytical and theoretical problems associated with such a claim, it would be simply fallacious on empirical grounds. Financialization has occurred as the rate of profit has stabilized in the long term, and may even have recovered, according to the estimate of method 1. Nonetheless, and bearing Chart 1 in mind, financialization presents a peculiar and interesting problem: financial profit rose strongly as a proportion of total profit at precisely the time when average profitability was broadly flat. How was that possible, considering that industrial profit is the most important source of financial profit, at least in theory? One argument is that financial profits were boosted by financial expropriation, which has directly transferred income and wealth of transacting counterparties to financial institutions. There is no doubt that the penetration of individual and household economic activities by finance has been a pronounced feature of financialization. Mature capitalist economies have been marked by the financialization of personal and family life during the last four decades. Similar phenomena have also occurred widely in middle-income countries at least since the early 2000s. Financial institutions have secured a large part of their profits since the early 1980s from transactions with individuals and households, which essentially means from mortgages and unsecured consumer loans. During the same period, there has also been strong growth of income from transactions in financial markets, resulting in fees and commissions as well as profits made on their own account by financial institutions. These sources of profit have characterized the activities of banks and other financial institutions during the years of financialization. Taken jointly, they indicate that financial expropriation, i.e., the direct transfer of income and wealth to financial institutions as profit, has marked financialization. In historical terms, financial expropriation has always been a part of the development of capitalism, and it was not eliminated by the rise of industrial profits through exploitation in the sphere of production since the early nineteenth century. Financial expropriation has been historically characteristic of capital involved in finance, since the latter is relatively detached from production and typically adopts a predatory attitude toward any flows of money revenue or plain stocks of money. Financial expropriation reflects the inherently unequal relations between counterparties engaging in financial transactions, especially when one is an individual or a household. There is a systematic asymmetry in information and power between financial counterparties which provides the social foundation of financial expropriation. This inherent inequality is also reflected in the social structure of financialized capitalism, marked by the emergence of new layers of profit appropriators, typically associated with finance. The lifting of regulations that began in the late 1960s and gathered speed in the 1970s and early 1980s, providing the terrain for the growth of finance. The introduction of alternative regulations, mostly focusing on the liability side of the balance sheet of institutions, and especially on capital adequacy, has provided a minimal set of rules guiding the market behavior of liberalized institutions, shaped by the institutions themselves. The rise of independent central banks, which have become the prevalent public institutions of economic policy, crucially setting the benchmark rate of interest. Central banks have been a pivot of financialization in both mature and middle-income economies. The provision of liquidity by the central banks has enabled financialized economies to overcome the frequent and nearly catastrophic crises generated by the interaction between real accumulation and finance. Finally, and critically, monopoly command over the final means of payment, which is no longer convertible by law into anything of produced value, has been the rock on which financialization has been erected. The final lifting of convertibility of the U.S. dollar in gold in 1971–73 has created enormous room for the state, and especially the central bank, to intervene in the sphere of finance by setting interest rates and providing liquidity. The degrees of freedom afforded to the authorities to intervene in the economy would have been inconceivable in earlier historical periods of capitalist development. The management of the rate of interest by the central bank—drawing on the power afforded to it by monopoly command over the final means of payment—has been vital to both financial profits and to profits accruing to the capitalist class in general. The rate of interest charged by the central bank acts as a benchmark for the financial system shaping the cost of funds to financial institutions and thus their profits. Furthermore, the central bank rate helps determine the lending rate of financial institutions, and thus the profits retained by industrial capitalists. By managing its lending rate, the central bank could materially affect the returns accruing to capitalist agents across the economy. In this light, the path of profitability in the United States could be usefully reconsidered from the perspective of the difference between the average rate of profit and the lending rate of the Federal Reserve. This spread is an approximation of the profits remaining to the capitalist class as a whole, once the Federal Reserve has been repaid. It is a type of “profit of enterprise” accruing to capitalists after the payment of interest. It is vital to note, however, that lending by the Federal Reserve is public credit advanced by a public institution, in expectation of future returns out of the total social capital. It is a form of credit backed by the creditworthiness of society as a whole, and therefore it is credit of the highest quality. It is also backed by absolute command over the means of payment and remunerated out of the overall growth of incomes and revenues across society. Thus the spread shows the profit remaining to the capitalist class as a whole after repaying the credit provided by public institutions to the capitalist class. where i is the nominal Federal Funds effective rate (extracted from the Federal Reserve System electronic database), and p is the inflation rate measured by the U.S. GDP implicit price deflator (2009=100, also extracted from the Federal Reserve System electronic database). Sources: Profit rate: See Chart 1; real interest rate: “Effective Federal Funds Rate” (Series ID: FEDFUNDS) and “Gross Domestic Product: Implicit Price Deflator, Index 2009=100” (Series ID: GDPDEF), Federal Reserve Economic Database (FRED), Federal Reserve Bank of St. Louis. Three points are immediately apparent. First, financialization commenced in earnest following the tremendous rise in the real Fed Funds effective rate in the late 1970s, the so-called “Volcker shock” aimed at controlling inflation. The “Volcker shock” narrowed the spread with industrial profit to its narrowest point, effectively eliminating this particular “profit of enterprise” for the capitalist class. Second, financialization has been marked by the steady decline of the Fed rate of interest, which has been close to 0 percent for long periods since 2000, and most prominently since the great crisis of 2007–09. Third, the behavior of public interest rates in the course of financialization (low or very low) has been the opposite of what one would expect from a putative era of the “return of the rentier.” Indeed, formally it appears as if the public sector has applied Keynes’s prescription regarding the “euthanasia” of the rentier, namely driving interest rates close to zero. In conclusion, the state appears to have supported the extraordinary profits made by financial institutions in the course of financialization. The secret lies in the widening gap between the Fed funds rate and the (flat) rate of profit. The management of the public rate of interest by the central bank (keeping the rate very low) has created increasing room for the capitalist class as a whole privately to appropriate profits, despite the stagnant rate of profit across the economy. This is the context in which private profits have been increasingly extracted through financial methods, as was shown in Chart 1. By driving the public rate of interest close to zero, society has subsidized the financialization of capitalism in unprecedented ways, and through public institutions. It is apparent that there has not emerged a rentier section of the capitalist class dominating the distribution of profit in its favor through high interest rates. Rather, the class as a whole has taken advantage of control over the final means of payment to drive public rates of interest close to zero and thus to increase private returns, even if the rate of profit has been stagnant. This is perhaps the grandest and most fundamental form of financial expropriation characteristic of the modern era, a hallmark of financialization. ↩Costas Lapavitsas, “Financialized Capitalism: Crisis and Financial Expropriation,” Historical Materialism 17, no. 2 (2009): 114–48; Lapavitsas, “Theorizing Financialization,” Work, Employment, and Society 25, no. 4 (2011), 611–26; Lapavitsas, Profiting without Producing: How Finance Exploits Us All (London: Verso, 2013). ↩See Harry Magdoff and Paul M. Sweezy, Stagnation and the Financial Explosion (New York: Monthly Review Press, 1987), and for further development, John Bellamy Foster, “The Financialization of Capitalism,” Monthly Review 58, no. 11 (April 2007): 1–12, and “The Financialization of Accumulation,” Monthly Review 62, no. 5 (October 2010): 1–17. ↩ For the concept of financial expropriation, see Lapavitsas, “Financialized Capitalism,” and Profiting without Producing . ↩See Lapavitsas, Profiting without Producing , chapter 6, for further analysis of this point. ↩Karl Marx, Capital , vol. 3 (London: Penguin, 1981), 567. ↩National Income and Product Accounts (NIPA), “Table 16.6: Corporate Profits by Industry,” U.S. Bureau of Economic Analysis, August 6, 2015, http://bea.gov. ↩Therefore, wL represents the total remuneration of labor, including a correction for the wage equivalent of self-employed persons. ↩Data set constructed by Gérard Duménil and Dominique Lévy in The U.S. Economy since the Civil War: Sources and Construction of the Series (Paris: CEPREMAP, 1994). ↩Anwar Shaikh, “The First Great Depression of the 21st Century,” in Leo Panitch, Gregory Albo, and Vivek Chibber, eds., Socialist Register 2011: The Crisis This Time (New York: Monthly Review Press, 2010), 44–63. ↩NIPA, “Table 1.14: Gross Value Added of Domestic Corporate Business in Current Dollars and Gross Value Added of Nonfinancial Domestic Corporate Business in Current and Chained Dollars,” U.S. Bureau of Economic Analysis, May 27, 2016, http://bea.gov; NIPA, “Table 6.1: National Income without Capital Consumption Adjustment by Industry,” U.S. Bureau of Economic Analysis, August 6, 2015, http://bea.gov. ↩ Though not in the manner assumed by post-Keynesian theory, which typically sees financialization as the outcome of state policies liberalizing the financial sector. The deregulation of finance presumably gave the rentier section of the capitalist class an opportunity to dominate the industrial section and extract additional profits. According to this view, the outcome has been deeply problematic for accumulation, at least in the U.S. economy, as resources were channeled to finance, leading to lower rates of growth for income and employment. This treatment of financialization, logical as it might seem, is unsatisfactory. Suffice it to consider middle-income countries, where financialization has progressed in leaps and bounds during the last fifteen years. This development has occurred while rates of growth have been rapid and accumulation has advanced strongly.